We rejoin our gang of dwarves, elves, a Hobbit, the humans, and a wizard in the midst of a dragon attack. Unfortunately, this is all wrapped up rather quickly and we move on to the actual heart of the story–the battle of the five armies. 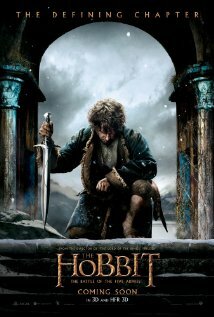 The dwarves go on to claim their mountain and the gold within which the dragon had been protecting, but an insanity takes over the dwarf king Thorin Oakenshield (Richard Armitage), and he becomes obsessed with keeping the gold at the cost of any life, and in finding the powerful Arkenstone. In the midst of this, the humans are now being led by Bard (Luke Evans) and have their own struggles with their village having been destroyed by the dragon. They want their share of the gold to rebuild their city but Thorin refuses. Gandalf (Sir Ian McKellan) has his own problems as he is still trapped (I have to admit I don’t remember by whom) but Galadriel (Cate Blanchett) and the other wizards rescue him and he goes to warn the others of a great darkness and danger heading their way–a darkness that will destroy them all unless they can come together. The little Hobbit Bilbo (Martin Freeman) ends up being a greater hero through all this than he ever would have dreamed–proving to be a loyal and courageous friend against all odds. Friendship and loyalty indeed are a strong message in this story and perhaps my favorite thing about it. This movie is filled to the brim with action–so much so that it didn’t feel nearly as long as it was. We also get some romance between the elf Tauriel (Evangeline Lilly) and the dwarf Kili (Aidan Turner). I think my favorite part of the movie beyond the theme of friendship, is Gandalf and the elves. However, I very much love Bard and Luke Evans who plays him, and whom I last saw as Dracula in Dracula Untold. Sir Ian McKellan is wonderful as Gandalf just as he is in everything. I also enjoyed Martin Freeman as Bilbo, and I don’t think I’ve enjoyed Orlando Bloom in any role more than I do of him as Legolas. If you love The Hobbit and the Lord of the Rings, or just stories set in that magical, Medieval type of world, then I recommend seeing The Battle of the Five Armies. The graphics for the dragon Smaug were wonderful and he was again voiced by the amazing Benedict Cumberbatch. It was over all an enjoyable movie, though with a great deal of sadness and death. My only complaints are that if you put all three movies together you see that it really should have been one, or two at the most, and it is far too easy to be lost. I highly recommend rewatching Smaug before seeing this one so you aren’t as lost as I was at times. This movie also has a nice set up for Lord of the Rings, which I may now rewatch. The Hobbit: The Battle of the Five Armies is currently playing at Dinuba Platinum Theatres 6, also in 3D. Showtimes can be found on their website. Platinum Theaters Dinuba 6 now proudly presents digital quality films in 2-D and 3-D with 5.1 Dolby digital surround sound to maximize your movie experience. I adored the old Hobbit books would love to give this one a try!